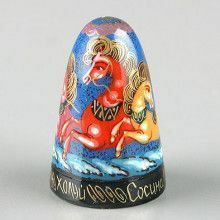 Wooden thimbles from The Russian Store are highly desirable, hand-painted pieces of practical art… Each beautiful wooden thimble was carved out of a solid piece of wood before being painted by a skilled artist. The artists in Russia paint elaborate miniature paintings like a Russian fairytale, or a cute cat design. 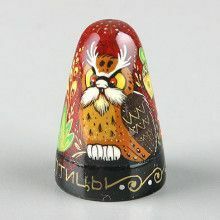 Almost all of The Russian Store’s wooden thimbles have an extra band of gold writing or swirl design at the bottom, setting these wooden thimbles above others. Thimbles from The Russian Store make perfect little gifts! They are small and light making them an easy gift to send. They are beautiful to just look at and keep on the shelf if you’re not a sewer. They are becoming more and more of a collectible as time passes on. 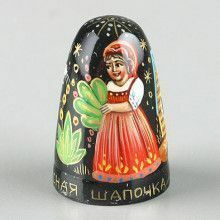 There is just no reason not to have a wonderful Russian wooden thimble in your sewing kit or on display! Thimbles have been around since probably the 1st century AD. Thimbles have been made out of stone, bronze, bone, ivory, silver, leather, glass, china, and more. 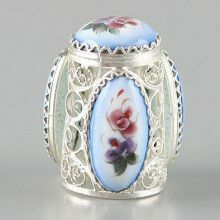 During the late 16th century to the early 20th century, thimbles were valued as objects of art. During World War I approximately 400,000 sterling thimbles were donated and melted down in order to buy much needed hospital equipment. After World War I, thimbles became a popular advertising medium for companies in all areas of manufacturing and services. 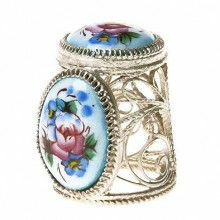 Thimbles were given as tokens of love during a Victorian time period that frowned upon gift exchanges between men and women. In 1856 Latimer Clark used a thimble to create a miniature electric cell. This thimble generated enough current to send a signal across 3,700 miles in a second. The phrase "just a thimbleful" arose out of the 19th century when they used thimbles to measure alcohol intake. Thimbles were given as engagement gifts from the fiancé to his future bride. The bottom part of the thimble could be cut off and used as the new wife’s wedding band when the couple married. Thimbles were used by certain school teachers to knock on the top of their students’ heads. "Thimble-knocking" came to be a term used by many women who would thimble knock the windows of men they were interested in. Thimblettes were born out of thimbles. Thimblettes are just like thimbles, but soft and rubbery. Mainly to protect the finger from paper cuts. Today, thimble collecting is gaining popularity.